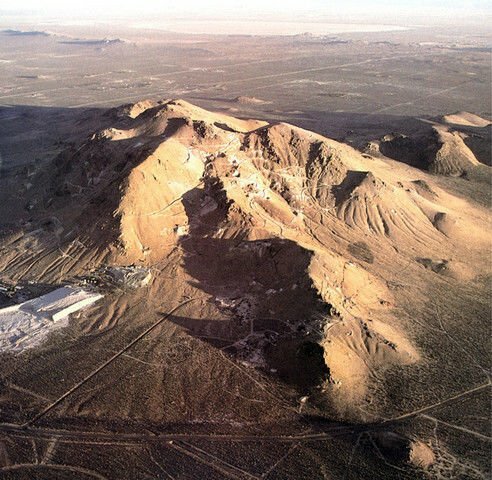 An aerial view of the Golden Queen mine site at Soledad Mountain located about five miles south of Mojave. File photo courtesy of Golden Queen Mining Co. Ltd. 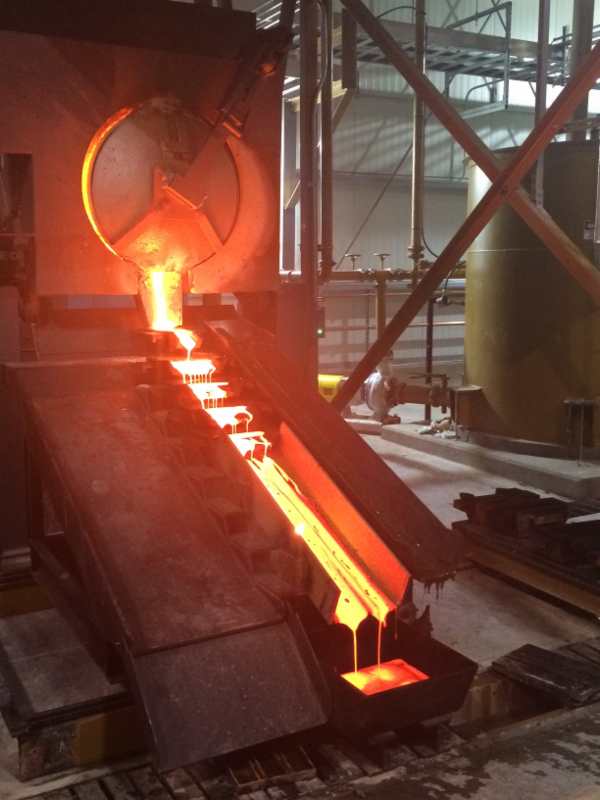 This 2016 file photo shows Golden Queen Mining Co. Ltd.'s pouring its first gold bar at the Soledad Mountain gold and silver mine, of which it has 50 percent ownership. The mine is located just south of Mojave in eastern Kern County. Photo courtesy of Golden Queen Mining Co. Ltd. In this file photo, a dirt road takes visitors to the entrance of the Golden Queen Mining Co. operation a few miles outside Mojave. The old Karma gold mine on Soledad Mountain still exists. Pictured here in a 2014 file photo. The mine is now Golden Queen Mining Co. Ltd.'s operation. In this 2014 file photo, work is under way in a workshop warehouse used for repairing large equipment including trucks, loaders, graders and more for the Golden Queen Mining Co. operation in Soledad Mountain. In this 2014 file photo, buildings go up on Soledad Mountain to be used by Golden Queen Mining Co. Ltd. near Mojave. In this 2014 file photo, painters put the finishing touches on a newly constructed building used for a workshop-warehouse where repairs of big equipment such as trucks, loaders and graders were to be used in Golden Queen Mining Co. Ltd.'s gold mining operation at Soledad Mountain near Mojave. In this 2014 file photo, Rick Davison with Gary Little Construction works on a new workshop-warehouse on Soledad Mountain, where Golden Queen Mining Co. Ltd. prepared for full operation near Mojave. In this 2014 file photo, a large workshop-warehouse is under construction where mining was to begin near Mojave. The family that owns about half of Kern County’s unprofitable gold and silver mine near Mojave has offered to buy the other half from the Canadian company running the operation. Golden Queen Mining Co. Ltd. said this week it has tentatively agreed to the Clay family's offer of $4.25 million for the company's 50 percent share of the heap-leaching mine at Soledad Mountain. Tuesday’s announcement came less than a week after the family agreed to a extend the deadline for a loan payment from the publicly traded company based in Vancouver, British Columbia. The extension to Feb. 8 from Feb. 1 added $75,000 to the loan's principal. Golden Queen’s losses deepened to $2.4 million during the third quarter of last year. That was more than a quarter more money than the company reported losing a year earlier. More recent performance figures have not yet been made available. The Clay family's proposal comes with a pledge that if by June 20, 2020, it is able to sell Golden Queen's share for at least $55 million — 12 times the purchase offer first disclosed Jan. 4 — then the family would refund the company 20 percent of the new sale price. As part of the proposed purchase agreement, the Clay family, which is among the company's top shareholders, has offered to forgive the $26.5 million it is owed by the company. A committee of independent company directors was formed to negotiate a purchase deal with the family. The company has until April 1 to see if it can find a better price for its share of the mine. The Clay family, through its fully owned company Auvergne LLC, has contributed equity and debt capital since the 1980s to fund development of the Soledad Mountain mine. Auvergne's manager, Thomas M. Clay, who filings say is based in Peterborough, N.H., has served on Golden Queen's board since 2009, and currently serves as its chairman and CEO. It wasn’t immediately clear who would operate the mine if the Clay family took full ownership of Golden Queen’s primary asset. Golden Queen has applied for permission from the County of Kern to add infrastructure and operations it says might extend the life of the mine beyond the 11 years anticipated when a feasibility study was conducted in 2015. Company records show production of gold and silver at the mine has increased but it’s still not enough to turn a profit. According to Golden Queen's third-quarter earnings statement, revenue from operations rose by 2 percent from the same period a year before as the mine increased gold production by 4.4 percent to hit 12,255 ounces. Silver production increased 109 percent over the same period to reach 100,408 ounces. As of Sept. 30, Golden Queen has continued to develop the mine's East Pit, which when complete was expected to provide most the operation's ore for two years or more. The company expressed hope the pit would provide higher-quality ore and less waste. Prior to the mine's 2016 opening with 101 employees, Golden Queen spent nearly 30 years preparing to mine gold and silver at the butte a few miles outside Mojave. Records show the company's payroll had expanded to 218 by Sept. 30. The company's stock, which trades on the OTCQX market under the symbol "GQMNF," was selling Wednesday afternoon for about 3 cents per share, down from a 12-month high of about 17 cents in June. A representative of Golden Queen said Wednesday the company would not comment publicly until a definitive agreement on the purchase proposal has been finalized. CEO: Thomas M. Clay, a board member since 2009 who also serves as chairman. Clay is also manager of the company that owns about 50 percent of the mine and has proposed to buy Golden Queen's 50 percent share. Production: Golden Queen began heap-leach mining at Soledad Mountain in 2016. It reported producing 12,255 ounces of gold and 100,408 ounces of silver at the mine during 2018's third quarter. Earnings: The company lost $2.4 million in the three months ended Sept. 30, 2018. That was 27 percent more than Golden Queen reported losing a year earlier. Stock: Golden Queen's shares trade on the OTCQX market under the symbol "GQMNF". This deal is subject to a vote of the disinterested shareholders. As a shareholder, I have no idea why the disinterested shareholders would approve of a sale now that the business is on the verge of profitability, everyone has held on through the lean years, and gold is on a huge upswing. It's interesting that the Clay family is trying to buy the mine - not sell their interest. And, they are basically trying to buy up the mine now at a fraction of what it's worth, based on stock prices that have no real relationship to the value of the mine since the stock is so thinly traded that it's apparent none of the substantial stockholders are trading. One year ago, the management extracted 13.5 cents a share in a rights offering, encouraging existing shareholders to increase their holdings without indicating at all that the Clay family creditors were not going to extend or restructure their loans into something that is financially feasible for the company. Had they so advised the shareholders, or if they had arranged a default in advance of the rights offering, it's doubtful any shareholder would have participated. As it is, they extracted many millions from existing shareholders, and are now offering to buy the new shares (and old shares) for about half what shareholders put up only a year ago. We will see what happens when the disinterested shareholders vote, but again I can't see why this deal would be accepted. If the Clay family wants to declare a default as to their loans, rather than restructure the loans, then I suppose it all ends up in a receivership or bankruptcy. But, at least that would treat all shareholders alike, and the Clay family might get paid for its shares what the other shareholders get for theirs if an outside buyer is found. In that event, of course, the Clays lose control of the mine they've built along with all the other shareholders. Given the risks, and the offer, I would think, rather than surrender our one-half of the mine to the Clay family for a pittance, it makes sense to push it all into bankruptcy if needed to find a buyer who will take out all shareholders (including the Clays) for the same price. But, I guess we'll see when the shareholders vote. A non-profitable gold mine? Who are you, Todd Hoffman?